The "problem" with this album is that the title suggests one thing and the music itself delivers another. The Afrobeat Chronicles suggests an album of post-Fela Anikulapo Kuti, in-the-groove, hot and raw Nigerian Afrobeat. This first impression is reinforced by a glance at the personnel listing, which is packed with horn players, drummers and percussionists and evokes memories of Kuti's classic Afrika 70 and Egypt 80 lineups. All of which proves you can't judge a disc by looking at its cover (not always, anyway). The main thrust of bandleader/keyboardist Funsho Ogundipe's music is altogether dreamier, prettier and gentler than the totemic word Afrobeat suggests. Look closer at the personnel listing and you notice a cello, acoustic guitars, a flute, a clarinet, a bass clarinet and a Steinway grand piano. There may have been a flute from time to time, but I can't remember ever seeing the other instruments onstage at Kuti's Kalakuta club. Yes, something other than straightline Afrobeat is abroad hereand once you've recalibrated your head and redirected your expectations, you'll likely find it enchanting and distinctly more-ish. If this is Afrobeat, it's cooked in a slower oven and spiced with ingredients from further afield than in Kuti's day. Countries represented in the band include Nigeria, Benin, Cameroon, Chile, Belize, Scotland and Ghana, all of whom bring traces of their native cultures to the mix. There are two explicitly Afrobeat tracks"Revenge Of The Flying Monkeys Part 2" and "Mr XYZ"and both, appropriately, were recorded in Lagos (the rest of the album was made in London). At seven and nine minutes respectively, they are, also appropriately, amongst the longest tracks. Even these tunes, however, are far from standard Afrobeat: irresistibly funky, but cooler and looser. Ogundipe's bluesy Steinway colours "Flying Monkeys," while Rob Lavers plays delightful flute on "Mr XYZ." Both tracks are distinguished by the outstanding electric bassist Falna Amodu King. The other tracks have an even wider focus. There's a Latin feel to the toplines of "Oga!" (pidgin for "big shot") and "Labi Igi Orombo" (Yoruba for "under the orange tree"), the first featuring Mike Collins' mellifluous Spanish guitar, the second Shabaka Hutchings' pretty clarinet. Trumpeter Byron Wallen's showcase, "Two In One (Les Ibeji)," is an impressionistic, post-In A Silent Way gem. It doesn't travel far over its seven minutes, but it travels deep, alongside Ogundipe's empathetic Fender Rhodes. Hutchings' bass clarinet is a highlight of "Song For Jenny," and Jenny Adejayan's cello is another. The bata drum choir on the title track, together with Curtis Shaw's Spanish guitar, make for another memorable tune. This album reveals new layers of thoughtful beauty each time you listen to it. Track Listing: Pepple Street Blues; Two In One (Les Ibeji); Oga! ; Open Your Eyes...And Your Ears Too; Revenge Of The Flying Monkeys Part 2; Afrobeat.com; Mr XYZ; Labe Igi Orombo; Highlife No.2; Omo Obokun; Song For Jenny. 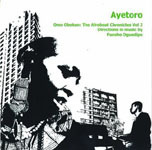 Personnel: Funsho Ogundipe: Steinway grand piano, Wurlitzer electric piano, Fender Rhodes electric piano, vocals; Ayo Odia (1,5,7), Ayo Solanke (5,7): tenor saxophone; Shabaka Hutchings (4,6,8,9,10,11): tenor saxophone, clarinet, bass clarinet; Rob Lavers (3,7): baritone saxophone, flute; Byron Wallen (1), Nathaniel Bassey (5,7): trumpet; Jim Mullen (1,4,6), Curtis Shaw (3,10), Mike Collins (3): electric guitar, acoustic guitar; Oroh Angiama (1), Nick Cohen (4,8,9), Falna Amodu King (5,7): electric bass; Karl Adedare Rasheed-Abel(3,6,11): electric bass, acoustic bass; Pharoah Russell (1,3,5,7), Robert Fordjour (6,11), Frank Tontoh (4,8,9); drums; Jenny Adejayan (3,11): cello; Nick Pamphilon (2), Jorge Santo (2,10), Dayo Rasaq-Ayandele (1,2,8,9,10): bata; Samson Olawale (5,7): congas; Angela Paz Alhucima (1-4,6,8-11): percussion; Kamoru Ayantunji (8), Hafiz (5,7,8): talking drum; Kwesi Frimpong (7): spoken word.